On April 4, 2018, at 1229 mountain daylight time, a Piper PA-12, N7709H, struck the tail of a Diamond Aircraft Inc. DA42 NG, N621ZC, during taxi at Bozeman Yellowstone International Airport, Bozeman, Montana. Neither the student pilot and flight instructor in the PA-12, nor the flight instructor and pilot undergoing instruction in the DA-42 were injured. Both aircraft had just landed after local flights, and both sustained substantial damage. The PA-12 airplane was registered to Val Halla Aviation LLC., and the DA42 was registered to and operated by Summit Aviation Inc. Both airplanes were being operated under the provisions of 14 Code of Federal Regulations Part 91 as instructional flights. Visual meteorological conditions prevailed, and no flight plans had been filed. After landing on runway 11, the pilot of the PA-12 was given instructions by the tower controller to turn left onto taxiway C2, and then taxi back to the approach end of the runway via taxiway C and hold short. While the PA-12 was taxiing, the DA42 landed on the parallel runway 12, and was cleared to exit at taxiway A3 and contact the ground controller. After reaching the approach end of runway 11, the PA-12 was instructed to cross the runway and hold short of runway 12 at taxiway C3. After reaching runway 12 the PA-12 was then instructed to cross and contact the ground controller. 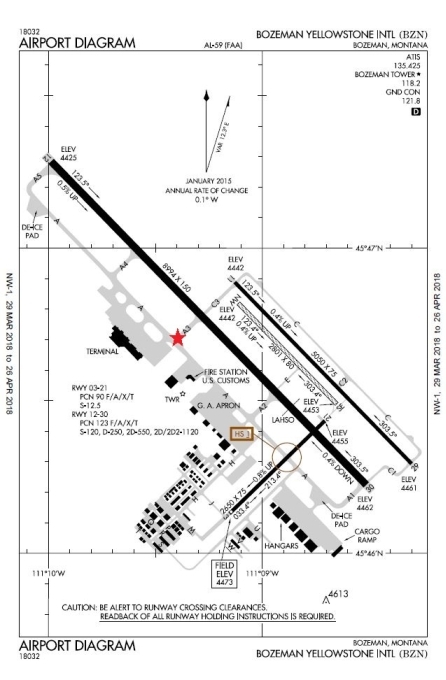 The PA-12 then crossed runway 12, entered taxiway A3, and struck the DA-42 which was still on the taxiway.